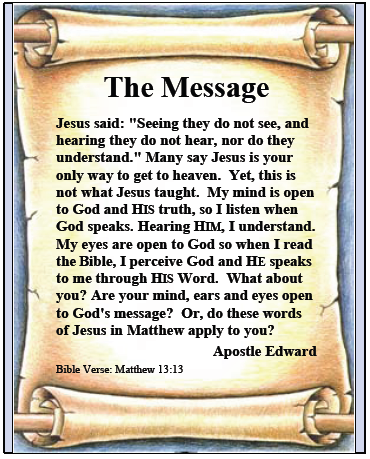 Apostle Edward | The Message | Seeing they do not see, and hearing they do not hear, nor do they understand. In "The Messenger", I taught that Jesus often spoke using spiritual metaphors. "It is the Spirit who gives life, the flesh profits nothing. The words that I speak to you are spirit, and they are life. But there are some of you who do not believe." Jesus said: "At the time [when I leave], you won't need to ask me for anything. The truth is, you can go directly to the Father and ask Him, and He will grant your request because you use my name." Jesus destroyed religious restrictions when it comes to communicating with God. Jesus also gave us the ability to go into God's Holy of Holies if we have given our hearts to God. Those who have accepted the sacrifice of God's only human begotten Son Jesus, and who have received the teachings of Jesus, have returned back to God Almighty. They now communicate directly with God and they ask of God in Jesus' name to honor Jesus. God's people can now enter into His Holy of Holies to fellowship with God at any time they desire day or night. To understand "The Message", you must have surrendered your heart to God as I discussed in "The Invitation" and in "The Messenger." Having done that, your mind, ears and eyes are now fully open to God. Your church should be a place to learn God's Word. It should also be a place of fellowship, support and above all a place of worship and prayer. You may find that a home church as described in the New Testament is the best. In a home church, everyone provides inputs and thoughts and together discern God's Word. Interactive, spiritually dynamic, small group Bible study replaces one-way sermons. IF you belong to a big church, you should participate in a small Bible study group to make sure you grow in God's Word. Then, there is our "Reticular Activating System." IF you have not had your mind opened as I have described, it may be because it is either partially or fully shut down by your Reticular Activating System or RAS. God provided us with an information gatekeeper in our minds to help us manage our information intake. The RAS is located in our brain stem and is used to either accept or reject ideas and input. Ideas and inputs are automatically accepted or ignored as affirming or conflicting with a prior held belief. The RAS operates on the level of the subconscious, but we consciously control it. If we have an idea or belief that we hold as absolutely solid, then the RAS automatically rejects anything that conflicts with that belief. Conversely, it allows in anything affirming it. Ideas come from many different sources into our brains. Some of them become like seeds in the garden called our belief system. Belief seeds planted into our minds grow stronger when they gain a root structure containing references that support the belief. A strongly held belief has deep reference roots that may include people or even a pastor or a church you have come to respect over many years. Belief roots can include a family history of supporting one religion over another. The root structure can also become strong as the result of repeated mental programming. Once ingrained into our minds, such strong beliefs are managed subconsciously by our RAS. It is because our brains have a limited amount of mental real estate we are willing to devote to different issues. The RAS, as a gatekeeper, reinforces what we believe is true and rejects what we believe are lies. Yet, each one of us decides what we believe. As an adult, many will have to challenge the beliefs passed down from our parents and prior generations. I myself have asked the question: "How did I come to believe this or that was true?" If you are still with me and I haven't lost you, these words from God may have a poignant meaning. Parents, families, friends, schools, churches and various fellowship groups will pass down beliefs that are corrupt. God holds each one of us accountable to discern truth. However, if you never challenge your beliefs, how do you know they are true? As a Christian, you must test your teachers and discern whether what you are being taught lines up with the Word of God. This is how you will come to know what truth is. The people of Berea opened their minds to the Apostle Paul's teachings. However, they THEN searched Scriptures daily to verify that what Paul taught them was God's truth. This is your test of a teacher of God's Word. That they teach Scripture in context and that you can verify the teachings with your own eyes. When Bereans searched Scripture, it was the Old Testament. References in the New Testament to Scripture all refer to the Old Testament. You cannot understand the New Testament if you do not understand the Old Testament. At all times you must stay within the contextual meaning of Scripture. Are you starting to get a picture? "Seeing they do not see, and hearing they do not hear, nor do they understand!" Could it be that the people Jesus tried to teach were so programmed by an existing religious culture that their minds just automatically rejected any attempt by Jesus to impart God's Word? Yes, that could have been one explanation. TODAY, we face a similar situation. For two thousand years, the Orthodox Church has programmed people with doctrines that are not supported by the Word of God. "Because they did not receive the love of the truth, that they might be saved." Have You Received The Love Of The Truth? If you have truly given your whole heart to God, either by finding Him directly or by finding God through His begotten human Son Jesus --- THEN you will have received the love of the truth. Without being a lover of the truth, you will have no eternal life. You know you are a lover of the truth by exhibiting one attribute of your faith. What is that attribute? It's a love for God's Word. And the disciples came and said to [Jesus], "Why do you speak to [these people] in parables?" [Jesus] answered and said to them, "Because it has been given to you [disciples] to know the mysteries of the kingdom of heaven, but to them it has not been given. For whoever has, to him more will be given, and he will have abundance; but whoever does not have, even what he has will be taken away from him [or her]. Therefore I speak to [these people] in parables, because seeing they do not see, and hearing they do not hear, nor do they understand. And in them the prophecy of Isaiah is fulfilled, which says: 'Hearing you will hear and shall not understand, and seeing you will see and not perceive; for the hearts of this people have grown dull. Is your mind, ears and eyes now open? It is important for your understanding of God’s Word that your mind, ears and eyes are fully open to God. I want you to understand God and be fruitful. 1. Those who do not understand will have the Word taken [or reasoned] away. 2. Those who suffer trouble because of the Word will stumble [and stop listening]. 3. Those concerned about the cares of this world and riches will become unfruitful and will have the Word rendered useless. 4. Those who understand the Word will become fruitful servants of God. Which category do you fall into as you hear God’s Word? Will someone take the Word away from you? Will you stop listening? Will the Word become useless to you? Or, will you understand and become fruitful? I tell you the same thing, right now! I am about to share some teachings of Jesus that may conflict with what you strongly believe is truth. These may be strongly held beliefs in your mind reinforced by years and maybe decades of Church orthodox programming. Can you accept the simple truth of God's Word? Let's start with Jesus' statement about returning to his God and our God. Jesus said to her, "Do not cling to me, for I have not yet ascended to my Father; but go to my brethren and say to them, 'I am ascending to my Father and your Father, and to my God and your God.' "
The unambiguous and clear meaning of John 20:17 is that Jesus states that he has a God he is returning to. Jesus identifies his God as the Father. Jesus states clearly that his God is also our God and also our Father. Do you acknowledge Jesus had a God? If not, stop here. This small tract seeking to impart Scriptural truth to you is meaningless if you refuse to accept the simple language of Scripture. If you cannot acknowledge mentally that Jesus had a God from his very own teachings, it means that you have strong orthodox or other beliefs programmed into your mind. It means that your RAS may be automatically rejecting any information that contradicts those beliefs. It also means that you are not saved, because you reject this simple truth of Scripture. Compare different bibles and you will find the same language. Before going on, you will need to surrender your whole heart to God and His Word. John 20:17 is a simple Scripture, but I have found that many orthodox Christians are unable to digest it as truth. Ergo, God's Word leaves them with a blank stare in their eyes and they shut down mentally rejecting all further communication attempts. For me, it is like presenting the "Tithe Law" stated in Deuteronomy 14:22-29 to a Christian who is programmed to tithe: same mental rejection. Let's try one more verse before going into some Scriptures on salvation including some things Jesus had to say about salvation. Hebrews 2:17-18 raises these questions. 1. Do you believe Jesus was made like us? 2. Do you believe he is God's High Priest? 3. Do you believe he was human like us? 4. Do you believe he suffered like us? In "The Invitation" and "The Messenger" you were presented with similar Scripture teachings, which contradicted orthodoxy. The web site contains the "Book of Edward" four-volume book set free to read online. I spent five years with God's Spirit writing it. I won't lose any sleep over people rejecting God's Word. I understand that not everyone is supposed to receive God's Word. Not everyone is headed to Heaven. Listen, we are NOT called to forcibly change people. Which brings me to this final thought before actually moving into some Scriptures about salvation: "The Message" from God. Many believe that you must mentally beat people into accepting Jesus or that they will be lost to Hell. However, all God asks is to simply present His Word and let the people choose. To respect the free will God gave all people. "He who is unjust, let him be unjust still; he who is filthy, let him be filthy still; he who is righteous, let him be righteous still; he who is holy, let him be holy still." The Church has long held John 14:6 as proof there is no eternal life or salvation unless you accept Jesus as savior. However, if this were true, there would be no Bible verses contradicting such a doctrine. The explanation for this verse is simpler. Jesus spoke and did what God told him to say and do. Jesus said that if you believed in him, you really believed in the God who sent him. "The way, the truth, and the life" refer to God's Word. It is God's Word that leads you home to Heaven. The phrase "no one comes to the Father except through me" literally reflects the fact that heaven's judgment line forms to the right of Jesus. Since Christ will judge souls for God and he sits at God's right hand, and the judgment line forms to the right of Christ – It means that every soul will literally go through or by Christ before they get to the Father. Judgment line starts at "X" to the left of Christ as you face the throne of God! John 14:6, is that easy to understand. While this exegesis may be unsettling to some, it does not require you check your brain in at the front door of the church and ignore many Scripture verses that oppose the Orthodox interpretation of the verse. Let me point out a few of them. A detailed discussion of this subject is found in the Book of Edward. These four Scriptures and others refute the idea there is no salvation outside of Jesus. Yahweh is the God that Jesus served! Given the above teachings from the Bible regarding salvation, Jesus is not the only way to heaven. It is obvious God had much more in His mind when it comes to granting salvation, even if it is granted through Jesus. Jesus rejects some Christians who claim him as their Lord. Therefore, even Jesus says there is more to salvation than just claiming him as savior. It's obedience to God's Word! So, we can see that "calling on the name of Jesus" is not a guarantee of salvation. One of the reasons for the confusion in Christianity is a misinterpretation of Apostle Paul. The word Lord in this verse, when properly translated refers to Yahweh or God. And, Paul is actually citing Scripture from Joel. Paul is not stating that you can call on the name of Jesus and you "shall be saved." Jesus confirms that those who believe in Yahweh or "the God who sent him" have passed from death into life in John 5:24. It is these people who "shall be saved." This is consistent with the last day pickup plan of God disclosed in "The Messenger" tract. "He [or she] who practices righteousness is righteous, just as [Jesus] is righteous." [1 John 3:7] Real faith leads us into a love affair with the God Jesus served. We then strive to obey God's Word and to emulate Jesus. This doesn't make us perfect, but it means we do practice God's righteousness. Jesus said: "I did not come to call the righteous, but sinners, to repentance." The Gospel of Jesus was not to mouth him as savior. The Gospel of Jesus was "repent, for the kingdom of heaven is at hand." And what about those who received John's water baptism for repentance and the remission of their sins. Are they saved? Eternal life? Jesus clearly states that those who received John's water baptism will enter the kingdom. Is this a problem for the doctrinal church? It should be. Here we have the situation where Jesus wasn't even involved. However, even though the people did not receive Jesus, they repented to God and received John's water baptism for the remission of their sins. Repentance will get you home to Heaven! Many preach that righteous people do not exist, but this is ignorance of God's Word. There is more to share with you, but room does not permit it here. Go to my website and sign up for my newsletter, read my blog and the Book of Edward. God will greatly bless you. Peter sums up "The Message" that God wanted you to hear. Open your heart.